I have had the pleasure of working with Kim for several years now, and she is a true horse person with excellent feel for her horses. 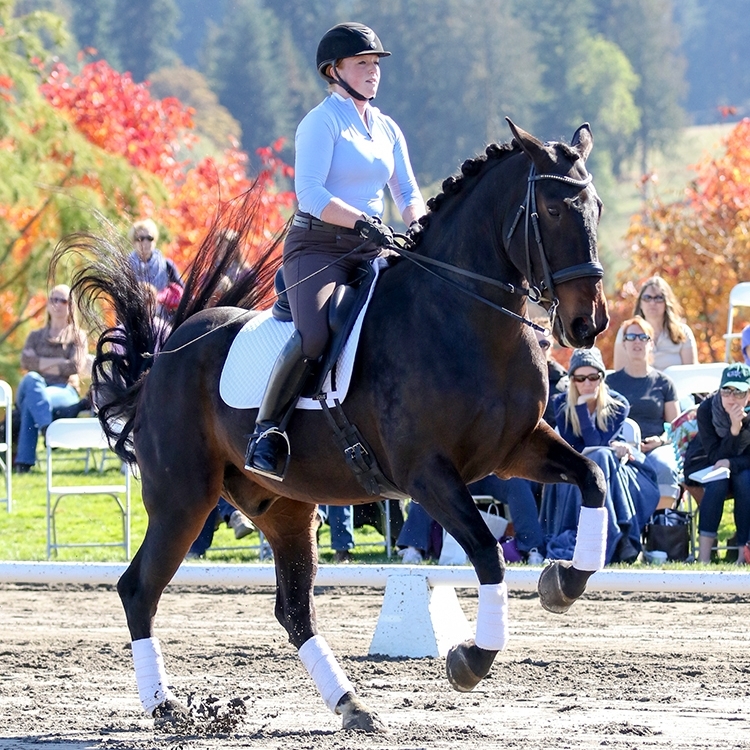 Kim's training of her horse, Oso Grande, highlights her exceptional abilities as a trainer, as she has taken an unlikely dressage horse and made him into a rising Grand Prix horse! Not only is Kim a talented rider and trainer, but she is also a wonderful person. Kim is kind, compassionate, and she has impeccable ethics. I would trust Kim with the care and riding of any of my horses. I met Kimberly at Little Bit Therapeutic Riding Center. I had wanted to learn more about horses and decided volunteering was a way to do that. I loved assisting in Kim’s classes and when I discovered she also gave lessons I had no option but to sign up! It’s been a whirlwind of horse education ever since. I’ve been taking dressage lessons from Kim now for about 3 years. Last year Kim was instrumental in walking me through the purchase of my first horse. Her skill, knowledge and confidence in me made the whole process fun and exciting. Kim has been amazing at working with my horse, Stella. She not only approaches training with kindness, but develops methods that bring out the best in both Stella and I. The whole adventure has been exciting and challenging – in the best of ways. I highly recommend Kim as a trainer for yourself, your horse or both! She’s amazing. My lessons with Kim have significantly changed my riding. Even though I am only able to ride once a week, I see and feel progress each and every lesson. My lessons with Kim have greatly increase my cinfidence when I am riding. I would not want anyone else teaching me to ride! Cedar Meadow Farm in Snohomish, WA.